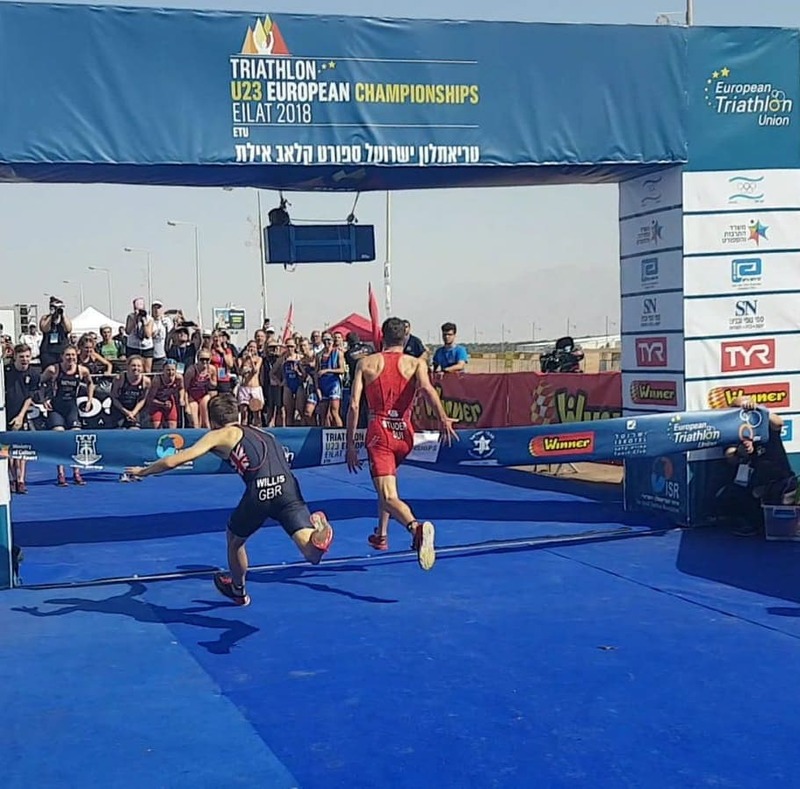 The Mixed Relays are always an exciting spectacle but this weekend in Eilat we were treated to a truly stunning performance by the 11 teams who signed up for the challenge. With the super-spring format and wit the layout of the venue, both LOC and Technical Officials worked hard to ensure that the flow would be smooth and some ingenious design gave a course that not only fitted well but also allowed all teams to go all the way to the finish, with no “lapping”. The first swim was led by Olivia Mathias for Team GBR. Close by her was Gabriela Ribeiro, for Portugal. The rest of the pack were only a matter of a couple seconds behind her but right at the back was Estelle Perriard. On the run to T1, along the 350m of blue carpet, the bunch came back together but it was Team GB and Olivia Mathias in the lead, with Portugal and Russia, with Valentina Riasova close behind. By the time that the first leg had been completed, the Swiss were comfortably back in contention and the handover went well. Perriard had run herself to pieces for the team. A superbly powerful swim and sprint along the blue carpet took the Czech Republic’s Lukáš Červenka into pole position. A penalty picked up by the German team meant that somewhere along the line a ten second penalty would have to be served. Some really powerful riding put Felix Studer and the Swiss team into a strong position and suddenly, as we looked down the start lists, the realisation that the Swiss had both U23 Champions in the final half of the race, the anticipation mounted. A frantic T2 saw Barclay Izzard hit the ground heavily on the dismount line. Despite the wounds to his legs, he simply got up and ran to his position. Would this crash drop the British team? Could Switzerland make it a clean sweep of the medals? The local crowds were urging on the Israeli team but they too collected a penalty, as did the Czechs. Ten seconds in the Penalty box on a race like this would dump any team back down the rankings. Julie Derron, racing the third leg for Switzerland looked impressive but she had to work hard and in so doing the race changed. Team GB, miraculously was still in contention after a tough run from Izzard. Now it wasGB’s Sophie Alden, Russia, with Ekaterina Matiukh and the U23 Champion were making it a very tough place to be for the other athletes and as the handover went so smoothly and knowing that three of the other teams had penalties, including the Israeli team who were a real threat to the podium, it was with great determination that the final showdown came to feature Grigory Antipov, Jack Willis and the newly crowned U23 Champion, Max Studer. The trio made an impressive attack and had pulled away on the bike. Coming into T2 and it was Willis and Studer, neck and neck out onto the run. Antipov struggled with the zipper on his race suit and lost a couple of paces as he tried desperately to cool his body down in the heat. It was only 1.1k but the run out of transition was uphill and into the hot wind. A dead turn at one end would jolt their bodies and it was here that Antipov lost another couple of paces. As the British / Swiss combo appeared on the horizon, they were running side by side and at full speed. To bring them into the finish area, another dead turn had been put in place. Studer edged forwards just enough to gain the advantage but Willis attacked and was back at his shoulder. The final 50m on the blue carpet was intense and nothing could separate them. Suddenly Studer found an extra gear and as he engaged for that final push, the line was there. Willis threw himself at the line but Studer, hungry for the win, had just enough pace to take his body forwards and claim the victory. The closest finish we have seen in a long time. The Swiss, ecstatic in the finish area. The Brits, cheering Willis to the very end and the Russians, delighted with bronze was a fitting end to a tough but thrilling weekend of racing. Sadly the superb live TV we had been given for the individual races was absent for this immensely exciting finale but a quick fix with a mobile telephone, a local sim card and a lot of running around meant that the folks back home could at least follow the race on our Facebook page. Thanks to Paz Eckstien for the finish line photo and Tamir Bogin for the race photos.